Clips From Episode 3: "Dead Men Don't Wear Spanx" Are Up Now! Watch Conan Episode 3 in full! It's Thursday, and our last show of the week is tonight! Bummer. HOWEVER, clips from last night's hilarious episode, "Dead Men Don't Wear Spanx" are up now on our video page - including the full episode, if you missed it!! I am really liking the fact that we've started naming each episode - it's a great little joke for the opening each night, and even though the names are random (for now), somehow the episode always seems to live up to its name!! 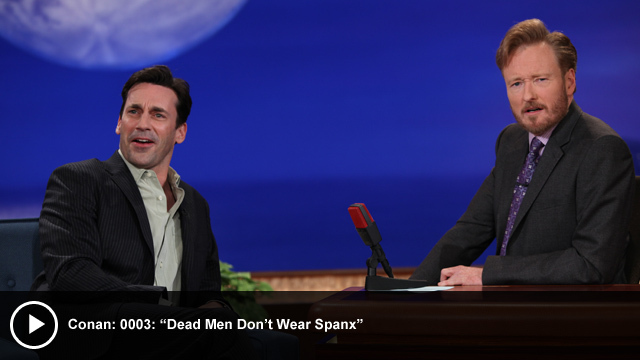 For instance, on "Dead Men Don't Wear Spanx" last night, Jon Hamm talked about how he almost got killed by a piece of the Mad Men set!! CRAZY CRAZERTONS.